School Library Journal continues it's coverage of book blogs with This Blog's For You: Ten of the best blogs for folks who take kids' lit seriously (but not too seriously) by Elizabeth Bird (aka Fuse #8 Production, a SLJ blog). As Bird's article notes, SLJ covered blogs as early as August 2005, with a cover story, Blogomania! Every day 12,000 new blogs are created. Here's how you can get in on the action. Two years later, in February 2007, I wrote Curl Up With a Cup of Tea and a Good Blog for SLJ. So now it's 2009; how do things look in the blog world? Bird's article is fabulous; it conveys much of what I think and believe about book blogging, especially blogging about children's and young adult literature. Disclaimer: not only do I appear in photos for the article, I also am quoted. But -- and this is important -- I am not one of the "ten of the best blogs" listed. It's important because it shows that those ten are independently judged; are best; and that Bird isn't defining "best" as "my friends, the people I know and talk with." Bird scores additional points by not saying "the ten best blogs"; saying ten of the best infers that there are more best blogs, this is ten of them. Back to the article. Bird addresses why people blog (and read blogs) and the role of book bloggers in the universe of authors, bloggers, publishers, librarians, etc. Bird wonders if this is all just an internal "you're so pretty" "no you're so pretty" group, i.e., an insular group. And explains why the answer to that is "no." There's talk of the usual to us bloggers -- transparency. Ethics. Just why one is blogging. 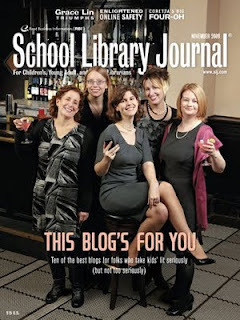 But those who read SLJ may not be aware that in the "wild west" no rules of blogging, we ask those questions, and apply the answers to what we do. Anyway, enough about me and why I like it. Go, read it, think about it, and post, tweet, and comment away. People are already adding other "must read" blogs in the comment section. Last week, I gave a behind the scenes look at the photoshoot. In More Meta, Roger Sutton at the Horn Book Blog considers what Bird wrote about blogs and collection development. Jen Robinson's Book Page points out how articles like Betsy's reach a broader, non-blogging audience.